It’s always nice to have certitude. While I was working on the flowers on this crewel embroidery project, knotting away with French knot fillings on each petal, it suddenly struck me that maybe I should be considering a different stitch. 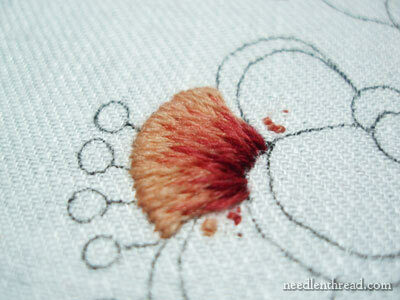 Maybe the French knots weren’t the way to go. Maybe I should consider long and short stitch. Fortunately, this design has two of the exact same flowers on it. So rather than pick out stitches on the flower I was almost finished with, try long and short stitch, not like it, rip it out, and put the French knots back in (oooooh, just writing all that was painful! ), I just jumped over the other flower and gave long and short stitch a try. It has potential. Each petal, though, would need something textured along the outside rim, to make the individual petals stand out. I could have started with buttonhole stitch, like I did with the petals on the French knot flowers, and then worked long and short stitch from there, I suppose. My thought was that, if I kept the inside of the petal very dark, then the next layer of petals (starting on their outside rim with the lightest thread) would really stand out. And they might have. But the first petal didn’t grab me. I went ahead with the French knots with a bit more certitude. There’s something about the buttonhole stitch that looks a little rough. The ruffling of the second layer makes it look messy – and the variation in stitch placement doesn’t help. This “messiness” is more aggravated, though, by the contrast in colors – the very light outer edge of the petals really stands out against the dark. Seeing the piece from a different angle changes it slightly. I like it ok, I guess. I didn’t spend much time stitching on Saturday (which makes it highly unlikely that I will meet my January 31st deadline and have this finished today). This is as far as I got. 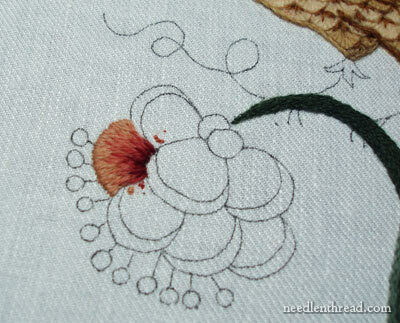 The stamens are worked in a very padded satin stitch – three layers of thread there, building on top of each other. Today, I’ll finish those little round blobs of wool, and then hopefully make some headway on the second flower. I’ll re-adjust my deadline to Wednesday. Your buttonhold stitch and french knots look very nice, and I wouldn’t rip them out! For purposes of information: I have a book by Ada Wentworth Fitzwilliam and A. F. Morris Hands, Jacobean Embroidery: Its Forms and Fillings, Including Late Tudor, A Batsford Embroidery Paperback (London, 1928; repr. 1990), which shows a flower remarkably like yours (on pp. 12-13. 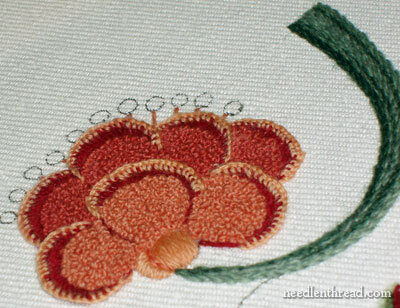 Each petal is outlined in stem stitch and then buttonhole stitch is worked right up against the stem stitch. The rest of the petal is filled with darning stitch. I’m not very tech-savy, so I can’t send a picture. I found your site recently, and I love it. It's all rather mind boggleing but very interesting. You're reallly making me get into the nitty gritty of the piece. Just when I think something is all settled, along comes the 'what if'. The stamens are sweet and just right but what if? No, just trickin' (family saying!). I'm not much help as I like both ways! I hope it's humming along for you and look forward to the final reveal! My vote is for the long and short stitch on the flowers, I love it and it looks really well finished. You could add an edge of split back around each petal which would make the edge a little more rounded and I don't think you will find it necessary to add another edging. The slight variation in the stitch direction of each petal and an under edge stitch will leave each petal quite separate from it's neighbour. I agree with you about the buttonhole stitch edging. In my opinion it is too light and is distracting. I never mind removing stitching when it doesn't seem quite right as I know it will always bug me and find me wishing I had removed it at the time. Had to pop in to say, as ever your daily email is full of wonderful advice and information. Your work is always beautiful, and I love the way you show the changes when you make them. I often can't see whats wrong (not the right word, but you know what I mean!) as I love your choices, but then you change something and its even more spectacular. Thanks so much for sharing everything. 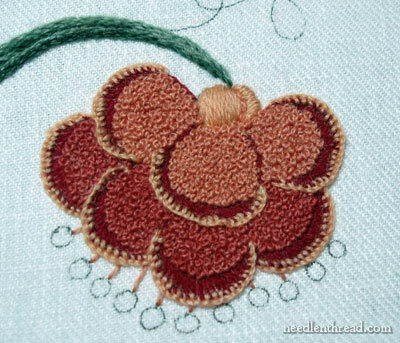 I just love, love, LOVE the french knots! They look just right and the whole flower looks a little retro which I think is 'way cool'. I wish I could get my little dots look as great as your stamens do. I just can't get them to be so high and round. What is your secret? A note of thanks regarding the cotton floche – I have started a teeny, tiny, little business making and monograming dinner napkins and was going to use good ole' DMC floss, but after reading your post have changed my ways and ordered a goodly amount of it from Hedgehog Handworks just catching their sale – such a great company! 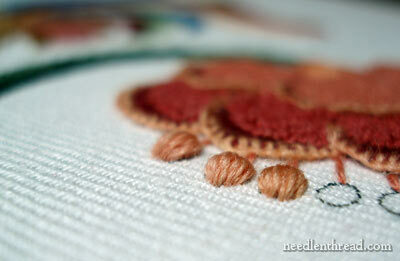 Next Next post: What Do Hand Embroidery and Canned Foods have in Common?